I have to say I wasn’t sure what to expect when I first heard about this record. I’m don’t ever really listen to audio books and I always get nervous about any adaptation or interpretation of Thompson’s writing. When it works it is great but when it doesn’t…well the less said the better. Thankfully, this record has more than exceeded my expectations. Which is a huge relief as The Kentucky Derby article is one of my favourite pieces by Thompson and is pretty much hallowed ground in the Gonzo cannon. Failure is not an option. I think it is fair to say that full credit must go to Michael Minzer for bringing Hal Willner on board as producer along with composer Bill Frisell, whose accompanying musical score is a delight and without which this project would have no doubt suffered greatly. As for the cast, obviously the number one question concerns Tim Robbins role as Hunter. When he was first announced in the role I was intrigued. I never thought that he was an obvious choice for the part but I have always been a huge fan of his work ever since I saw The Shawshank Redemption (if you are one of the few mortals who haven’t seen this film then you need to rectify this immediately). I suppose having gotten used to Johnny Depp portraying Thompson onscreen it has become difficult to imagine anyone else playing that role. Comparisons are inevitable, even for such a different project as this. Thankfully however, Robbins is an inspired choice as the Good Doctor. At first it is a bit jarring to hear another actor take on the role, but what a take it is. Robbins brings a wealth of experience to the table here and it really shows. Some people might find Robbins increasingly frenetic delivery a little odd but I think it fits with the material well, particularly as a reflection of the manic energy that defines the Gonzo narrative. I also took particular delight in the fact that Ralph Steadman came on board to play his part in the story, which lends that extra dimension of authentic Gonzo flavour to the album, not to mention his iconic Kentucky Derby artwork that decorates the sleeve of the album and CD itself. The rest of the cast put in solid performances but I have to single out Dr. John for his take on Jimbo which had me grinning like a fool. He absolutely nails the part. So now that the 138th Kentucky Derby is less than a month away, what better way to mark the occasion than to make yourself a Mint Julep and listen to this fantastic release courtesy of Paris Records and 429 Records. Early spring 1971 and the first rays of the rising sun creep into a room at the Ramada Inn just outside Pasadena California, where one Hunter S. Thompson is holed up, crouched over his IBM Selectric, hands flashing back and forth over the keys, as though directing a kind of demented orchestra. The words flow faster and faster, a chaotic hell broth of paranoia and insanity that would culminate in one of the most original, hilarious and celebrated statements on the sixties drug culture – Fear and Loathing in Las Vegas. Thompson’s dissection of the dark side of the American Dream would catapult him to rock star status overnight and confirm his status as the infant terrible of the literary world. 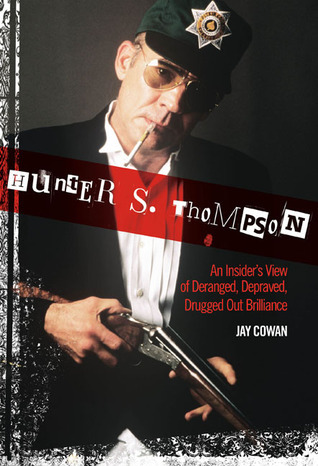 Through the pages of Rolling Stone he unleashed upon an unsuspecting American public what is undoubtedly his greatest artistic creation, not Gonzo Journalism as many would have you believe, but rather his compelling and brilliantly subversive literary persona – the Hunterfigure – as best exemplified through the guise of Raoul Duke. What followed for Thompson was an almost Jekyll and Hyde relationship with his literary alter ego, a continuous symbiotic state of co-existence with the monstrous and unruly Duke, for good or ill. Such was the enduring power of the character, heightened by Ralph Steadman’s darkly captivating illustrations, that the public perception of Thompson became truly distorted, unable to distinguish between the serious author and the myth of the drug crazed Gonzo Journalist. Of course, Thompson deliberately contributed to this confusion, blurring the boundary between author and character to such an extent that the ensuing confusion was inevitable. Such was his method actor-like approach to the persona, spanning almost his entire literary oeuvre, that one can be forgiven for being unable to identify the thin line of differentiation between his public image and private self. Well there certainly has, I mean you have been putting it on me all week…I’m not sure at all what you think you are shooting…I have no idea whether you think you are making a film about Duke or Thompson. That’s a serious point, I’m never sure which one people expect me to be and very often they conflict, most often as a matter of fact with people I don’t know, I’m expected to be Duke more than Thompson…I’ve been using Duke for 10 years, maybe more, I began to use him originally as a vehicle for quotations that nobody else would say, that was me really talking, those were my quotes…I’m really in the way as a person, the myth has taken over…I’m no longer necessary, I’m in the way. It would be much better if I die. Then people could take the myth and make films. This year marks the 40th anniversary of the publication of Fear and Loathing in Las Vegas and yet the discourse surrounding Thompson’s seminal work has changed little – largely still centred upon Raoul Duke and Dr. Gonzo’s astronomical drug consumption and withered analysis of the American Dream. Duke, of course, looms larger than ever, aided in no small part by the tour de force that is Johnny Depp’s portrayal of the character in Terry Gilliam’s cinematic adaptation, which in itself has attracted a sizeable cult of worship. Just as in Thompson’s own lifetime, the drug crazed Raoul Duke persona overshadows the brilliance behind its very creation. In retrospect, Thompson’s remarks to the BBC now appear to be particularly salient. That Thompson is still largely misunderstood as a writer is unsurprising though, as there is a long standing pattern of ignoring the thought process behind his greatest work. More often than not, the trajectory of critical analysis has focused on the cult of personality surrounding Thompson and that of his legendary drug consumption, coupled with the subsequent effect of these influences on his writing. Rarely does it pause to reflect on just how and why Thompson came to that point in the first place. There is a wealth of material that pinpoints The Kentucky Derby is Decadent and Depraved as marking the birth of Gonzo Journalism, but there is a dearth of analysis on the seeds that were planted along the way. The same goes for Duke, with little discussion of the various incarnations of the Hunterfigure prior to his most infamous outing in the pages of Rolling Stone. Yet it is an essential task and one that does not lead to an undermining of Thompson’s as a writer. In particular by investigating the narrative genealogy of the Hunterfigure we can discover new layers of meaning to every facet of his writing and thus extend the discourse far beyond the current narrow parameters. This stunning coffee-table compilation of Tom Benton’s art is a treasure trove of material that is of huge significance to not only political art history, but also the history of Gonzo Journalism. Many of you are of course already familiar with Benton through his collaboration with Hunter S. Thompson on the Aspen Wallposters and his striking skull design for the cover of Fear and Loathing: On the Campaign Trail ’72. Yet to date Benton’s work has remained largely inaccessible, with the Aspen Wallposters proving to be particularly elusive due to their scarcity and the high price that they command on the rare occasion that they become available on the market. Since I started this website just over three years ago, I have been inundated with enquiries regarding the Aspen Wallposters. I think it is fair to say that Benton has been criminally overlooked, not just in relation to his collaboration with Hunter S. Thompson, but also in terms of his contribution to protest art and political activism both at a local and national level. In this sense, full credit must go to Daniel J. Watkins for undertaking the mammoth project of cataloguing over 500 pieces of art spanning five decades of Benton’s career, a task that involved traversing the length and breadth of the country in search of these prints, all of which were produced in limited unnumbered runs. No mean feat. From this wider collection, Watkins has selected 150 prints divided into sections representing the evolution of Benton’s career, from his first posters as advertisements for various businesses and events in Aspen, through his political activism and collaboration with Hunter S. Thompson, to his later foray into abstract monotypes and oil paintings. The final section showcases the four buildings that Benton designed and built in Aspen. Considering that my knowledge of art is fairly limited, I must admit that my initial interest in this book was based solely on the fact that the Aspen Wallposters were finally going to be widely available to the Gonzo community. In many ways they remained one of the final pieces of the Gonzo jigsaw that had yet to fall into place, which is pretty remarkable given the prominent role they have played in relation to Thompson’s infamous Campaign for Sheriff of Aspen, as detailed in his Rolling Stone article The Battle of Aspen – Freak Power in the Rockies. However, the influence of Benton upon Thompson, and vice versa, goes far beyond this collaboration, a fact that is evident from the very first image presented in this book – A stark ,volatile, grey and white print emblazoned with the words – ‘The Garden of Agony – Abandon All Hope Ye Who Enter Here.’ The footnote informs us that ‘The Garden of Agony’ was the name of Benton’s studio. Given the deep affection for Aspen that was central to Benton’s creative drive it is unsurprising that he found the perfect platform of expression through the medium of campaign posters centred on local politics (and later on a national level). What is intriguing about many of these posters is the manner through which Benton’s aesthetic approach integrated political slogans with powerful visual symbols of the natural beauty of the Aspen wilderness. Of course there are exceptions, such as his poster for the Woody Creek Caucus which is emblazoned with one of the greatest political slogans I have ever seen (the hallmark of a certain Doctor that lived there). Indeed it is of course the Gonzo section of the book that showcases the most recognisable aspect of Benton’s political art. 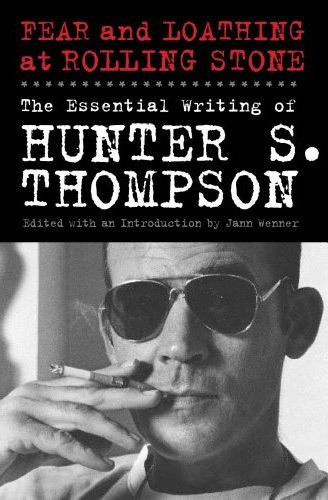 The content included here is a rare treat for any fan of Hunter S. Thompson with the aforementioned Aspen Wallposters taking centre stage (all of which fold-out from the book). Their inclusion marks the first time that all six posters, each including Thompson’s writing on the reverse, have been made available since the original run of prints in 1970. I don’t want to spoil the details so all I will say is that the posters and accompanying text is pure vintage Gonzo at its best. To finally have this material is to fill a gap in the Gonzo narrative that has been there for far too long. Yet this is not the only Gonzo material that Watkins has included here, with an original voter registration poster for the Thompson for Sheriff campaign also featured, together with an article from The Aspen Times on the “Scurrilous Sheet” by Benton and Thompson and finally the two-page advertisement from Scanlan’s magazine in relation the ill-fated Nixon Wallposter. Benton’s collaboration with Thompson on the Aspen Wallposters appears to have been a seminal event in his artistic development, certainly in terms of influence carried forward in relation to his political art. 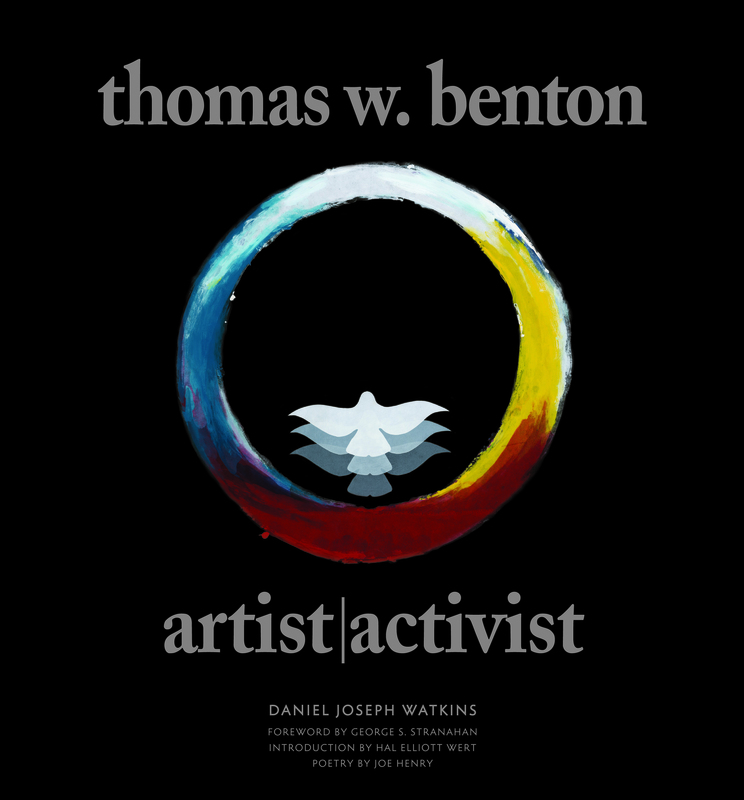 The activism section of the book clearly illustrates this, with many of Benton’s prints echoing his work with Thompson, which is perhaps facilitated by the subject matter – a thorough disdain for Richard Nixon and American foreign policy. Overall this book is a testament to a man who not just embodied artistic vision, but who also had the courage and the passion to use his gift to make his feelings known in a world where speaking up is frequently rewarded with being shot down. Benton’s art tells a story, not just about a single cause or person, it is multi-faceted – at once portrait of a life, a city and a nation. One owes respect to the living: To the Dead one owes only the truth. I have to admit that when I first heard about this book I was a little apprehensive. The amount of ink spilled over the years on Hunter is extensive. Some of the better titles I have enjoyed immensely and I return to them regularly. I cannot say the same for them all however, with one offender in particular annoying me to the point that I fired it into the rubbish bin because it was the best place for it. I guess I am a tough customer to please. Having read everything on Hunter it really takes something special to stand out from the crowd. Thankfully this offering by Jay Cowan more than passes the test. So why exactly does this book add anything new to the field? Well for one Jay Cowan had access to Hunter that few can match. Not only was he a close friend but he actually lived for a number of years at Owl Farm in the guest cabin. The detail that Jay provides about life at Owl Farm is immense and it ranges from an almost inventory-like description of the house and surroundings to various stories from over the years. Some of these capture the King of Gonzo in all his glory, holding court amid the madness and frequently trampling the limits of excess to a pulp. This is familiar and expected territory regarding any book on Hunter and here Cowan more than delivers. Yet he also carefully balances the madness with a genuine account of Hunter the Writer, hard at work and dedicated to perfecting his craft. 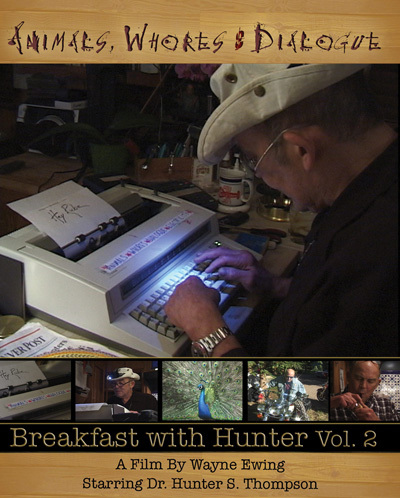 There is an abundance of information regarding not only the process behind Hunter’s work but also the advice that he dished out to Jay. Whether it was some wisdom on how Jay could develop as a writer or informing him on how NOT to handle a loaded weapon, Hunter was more than happy to help out. Cowan is not afraid to discuss some of the more difficult issues in relation to his friendship with Hunter either. 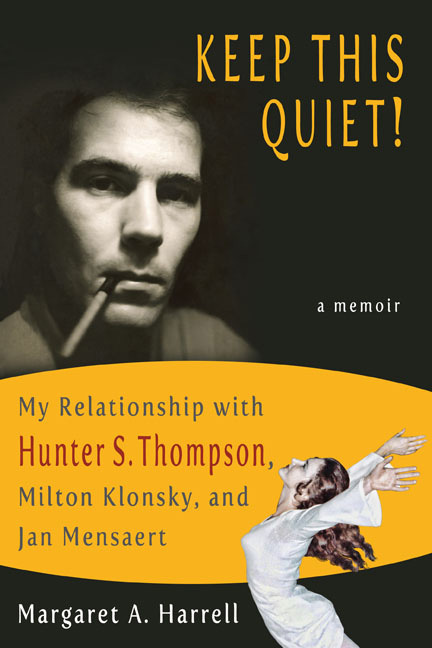 He does not try and glamorize the Gonzo lifestyle and rightfully so – Hunter didn’t recommend it for a reason. The downside could be extremely harsh and unforgiving and not everybody can deal with or cope with it. Ever wondered what would happen if Hunter was confronted over his self-destructive behaviour? Well why not read about it from somebody who was there and did just that. Cowan also delves into the fallout after Hunter’s death and how it affected everybody. To be honest I believe that some of the uglier issues regarding the aftermath ought to be discussed and resolved in private so the less said about it here the better. Obviously everybody has a different take on these things and that is just mine. There are some really hilarious tales in this book and I have to say that one of them, courtesy of Sheriff Bob Braudis, had me in stitches. The photos are also worth mentioning as many are previously unpublished. Overall this book is a very good addition to the field and if you enjoyed The Kitchen Readings by Michael Cleverly & Bob Braudis then you will certainly enjoy this.